Since 1973, an average of five Kentucky Derby (gr. I) starters have ran back in the Preakness Stakes (gr. I). By that standard, this year's class of sophomores is under-performing, with only three Derby runners—California Chrome (first), Ride On Curlin (seventh), and General a Rod (11th)—are likely to start in the Preakness. Derby starters have dominated the Preakness and Belmont Stakes (gr. 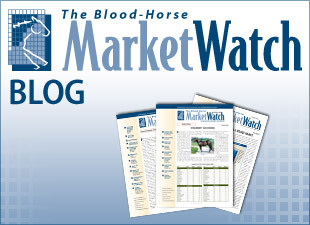 I) since 1973, so their absence from the Preakness may be good news for the newcomers. 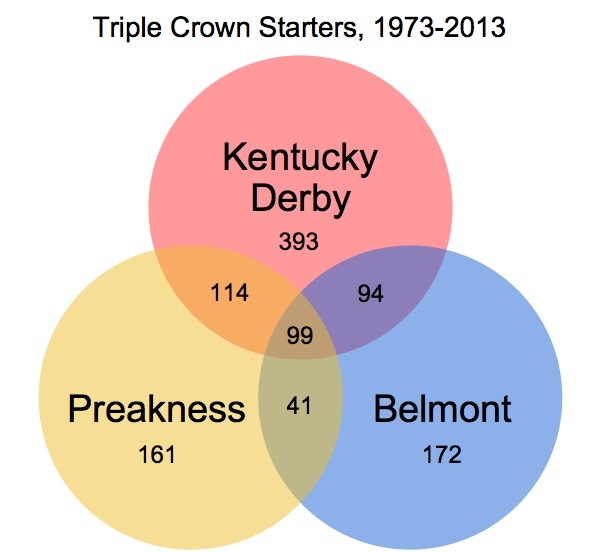 Over the past 41 years, 28% of Kentucky Derby starters also ran in the Preakness, and 26% ran in the Belmont. Derby runners have accounted for 72% of the top-three finishers and 74% of the winners of the Preakness and Belmont during that time. Derby starters also have a better average finish position in these races compared to horses that didn't start in the Derby. Despite the good record of Derby runners in the Preakness and Belmont, sending a horse to all three events has become unpopular, as illustrated in the chart below. There has been a slight increase in the past three years, thanks to three horses in both 2011 (Animal Kingdom, Shackleford, and Mucho Macho Man) and 2013 (Orb, Oxbow, and Will Take Charge) starting in all three events, but overall there has been a distinctive decline in the percentage of Derby starters to contest all three races. The percentage of Derby-Preakness runners has remained steady over this time period, but the trend of skipping the Preakness and waiting for the Belmont is growing. Seven of the 14 horses in the 2013 Belmont field followed the Derby-Belmont pattern, including winner Palace Malice, and five of the the past 10 Belmont winners skipped the Preakness after starting in the Derby. Several Derby contenders that opted out of this year's Preakness are under consideration for the Belmont, including Commanding Curve, Danza, Wicked Strong, and Samraat, who finished second, third, fourth, and fifth, respectively, in the Derby. Considering the recent record of Derby runners in the Belmont, this is setting up to be a contentious conclusion to the Triple Crown series.